Approximate numbers are very useful for talking about generalities, making estimates, and just flat-out guessing. English only has one approximate number, content to use "about" in front of cardinal numbers any time a guess is required. In contrast, French has about a dozen approximate numbers. In 2019, Easter is on 21 April, and the week immediately preceding Easter (Sunday to Saturday) is called Holy Week. Here's all the French vocabulary you need to celebrate this Christian period of renewal. Love is in the air, and there's no better way to express it than in French, the language of love. Learn how to talk about love and friendship in French. You know the French terms for family members and job titles, but what about other categories of people? Here's a handy list of people words, both general and specific. Traveling in France often means driving, which can be a puzzling mix of unfamiliar signs and unfathomable rules of the road. But before you even get to that, you have to actually rent the car, so here are some useful phrases to help you get the car you want. 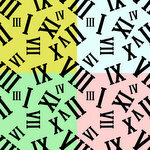 Roman numerals are used far more often in French than in English, as both cardinal numbers and ordinal numbers.